The story of rags to riches is normally an uplifting, crowd-pleasing one. Slumdog Millionaire (which shot Dev Patel into the limelight) showed an enchanting, Bollywood-dancing India, likewise - and cementing his box-office career - was tourist-friendly The Best Marigold Hotel. 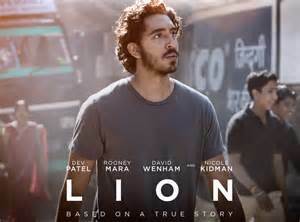 Lion, nominated for 6 Oscars including best picture, is something different. Based on the memoirs of Saroo Brierley’s “A Long Way Home” here we have a movie that isn’t afraid to show the suffering of an over-flowing population. Five-year-old Saroo (Sunny Pawar, giving a powerful debut) helps his mother collect rocks and steals coals with his brother. This is the rag part of the story, but the tragedy never lies in the abject poverty of the family, that comes when Saroo is torn away from home on a high-speed passenger train (kids never do stay put when you tell them to). The nightmare two-day ride takes him to Calcutta – a city he doesn’t speak the language. Hungry, alone, never more vulnerable, Saroo slips away from one dark fate after another (kind strangers with orange pop are not always to be trusted, and police don’t take the cigarette from their lips as kidnapper’s rush pass them). Finally, he is ‘saved’ and a new life, a new family awaits him in Tasmania, Australia. Two decades go by. Saroo (Oscar-hopeful Patel) comes swimming out the ocean, now a handsome, chilled Aussie who, when asked was he born in Australia, nods and then corrects himself. He’s from Calcutta, no, he’s adopted from… he isn’t quite sure. His comfortable life with his wealthy family, college friends and fun lover (Rooney Mara) starts to become confused and memories from his childhood begin to haunt the film. The transformation is extraordinary. In one scene, his proud parents celebrate his success, while the absence of his adopted brother is like a forewarning. He represents failure: unlike Saroo, his adopted brother does not adapt, he refuses to and we see the trauma of his past still fresh into adult life. Similarly, when Saroo begins to embrace his past, it quickly takes over. An escalator scene shows the literal downward spiral; Saroo has become a stranger, an empty shell, and even his clothes reflect his mental state showing him as virtually homeless. Finding home is not a therapeutic experience in this movie, it’s an obsession, egged on by the visions of his real brother and mother who are trapped in the same state of constantly searching for what they have lost. The pain of it all echoes through the whole family, and his adoptive parents (Kidman at her finest) strain themselves trying to hold together the family they’ve built. Lion is transnational cinema at its rawest. It would be easy to write the movie off as overly sentimental, but there's a complicated narrative at its heart. The loss of identity that comes from forced displacement is an important story to tell. The fact that this is a true story (with writing credits from Saroo Brierley himself) makes it even more relevant. A stunning first feature film from director Garth Davis. 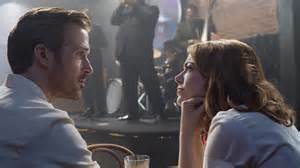 Hollywood has fallen in love again. Five years on from The Artist, a beautiful nostalgic nod to cinema history, here we are again in the land of bygone times.